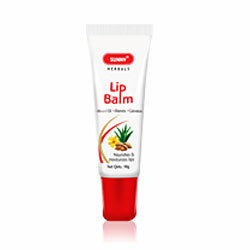 Bakson's Sunny Herbals Lip Balm Moisturizes & Nourishes Lips, Lip Dryness, Cracking & Chapping Lips. Enriched with goodness of Almond oil & Vit. E, it deeply moisturizes & nourishes lips. Enriched with goodness of Almond oil & Vit. E, it deeply moisturizes & nourishes lips. Herbal constituents like Aloevera and Calendula help in hydrating & toning lips by checking dryness, cracking & chapping. Apply evenly on lips 2-3 times a day either directly from the tube or with the fingertips as needed.